Just a touch of romance for my sunroom. Evoke a sense of mystery with this elegant print. Hand-wrapped and giclee printed for sharp detail and a textured look, this print showcases a luminous lakeside scene. Very pretty in person. The lights in the tree almost glow in the evening. This looks exactly in person as it does on the website. Canvas is coated which is great for dusting and includes attached hardware on the back. Simple and ready to hang. And, Toby (our dog) approved, lol We choose this print because we have a large brown sectional, grey walls and blue wingback chairs in the living room. This print does a nice job of tying all those colors together. Love the picture, exactly what I was looking for in the bedroom. It’s the 24 x 36. Perfect size. Quick delivery and great service. I know that art, as is beauty is in the eyes of the beholder! That being said...I love this "Twilight Romance" picture. For me I see and feel the expression and the energy of love and romance. It reminds me of when I fell so deeply in love 22 years ago with my now beautiful husband!!! I have hung this beautiful piece of art in my den and it is amazing how the second I enter that room, my eyes gravitate to it and my heart flutters and it makes me smile. 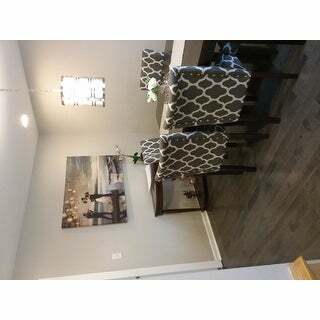 Thank you Wexford Home and Overstock for making this available...I LOVE IT! This is a beautiful canvas print. Looks great in my master bedroom! This print is very beautiful. The quality is excellent and it was packaged very well with styrofoam on the corners and wrapped in plastic inside of the box. It shipped quickly. Love this canvas! Each time I look at it I fall in love. It is such a romantic print! I love the vibrant colors of this romantic print!It goes beautifully in my livingroom. This canvas print is breath taking and absolutely Gorgeous! Great quality!! This piece is over the bed in our master suite. It is a romantic & sweet touch to the haven that is our bedroom. Well printed, true to picture. Do recommend. This canvas is lovely! It will work in any room of the home. I placed it in my family room where the colors fit just perfectly. I am very pleased with Overstock in providing such lovely products. I recommend this to anyone who is looking for a romantic and lovely piece of art. Congratulations to the artist. This canvas was well packed to avoid any damage and was shipped by UPS in an expedient manner. 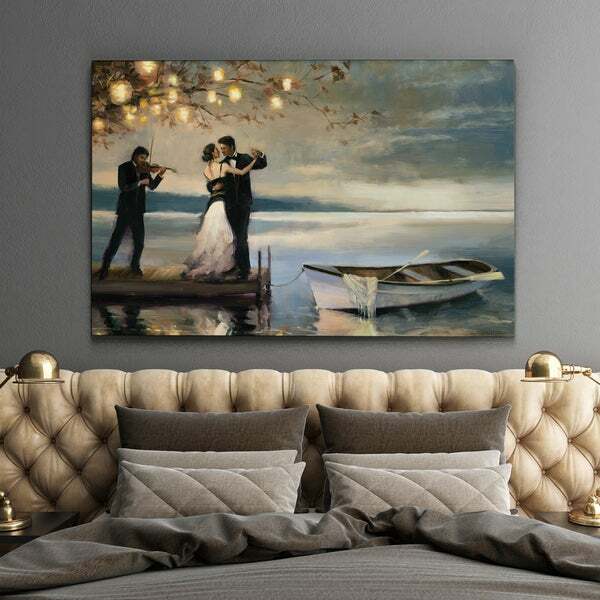 No one should hesitate to order this beautiful artwork if they wish to enjoy a romantic water scenery. I bought this piece to put it over my bed. I get compliments all the time about it. The colors are not bright and jumping out at you. They are extremely subtle which is why I love it. My color scheme is silver/gray with ivory and white. My furniture is black. It blends in perfectly, I absolutely love it! In my dining room....classy and elegant. However not sure if its the wall but its not laying flat........but I still love it! I searched long and hard for a photo to put over my fireplace in the living room. I always liked the romantic theme and how the gallery canvas. I came across this one and just loved it. The colors matched the colors in the living room and the man and woman look like my boyfriend and I. 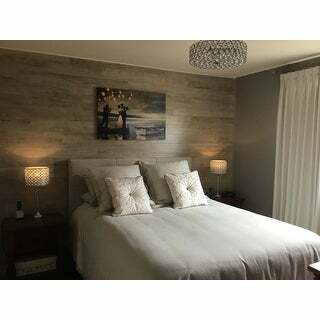 Its romantic, serene and ties the room all together making it a warm cozy feeling. I got the largest size. I am not disappointed. I really like this piece of artwork and I am completely satisfied with this purchase. I am a bit hesitant to purchase artwork online as I prefer to see it in person in order to really get a true feel for the colors, picture quality, ambience, etc. ; however, this piece is actually as nice as I was hoping it would be. I would recommend this piece to anyone who is interested in this type of artwork. The colors are very pleasing and the lighting in the picture appears to really be lit. It has a bit of a "Thomas Kincaid portrait of light" appeal. Very pretty and romantic piece of artwork. It’s beautiful! I’m very glad that I have decided to buy this canva. I highly recommend. I’m change it my living room, I’m getting new sofas. I can’t wait to finish my living room! Love, says it all! Wonderful colors on canvas. Everyone loves it! I am very happy! Bought this for one of my guest room it looks great, Fits wonderfully on a big wall. Good quality. I would definitely recommend this picture. "How high should a canvas be hung from the top of a sofa?" "What is the difference between gallery-wrapped and canvas art?" 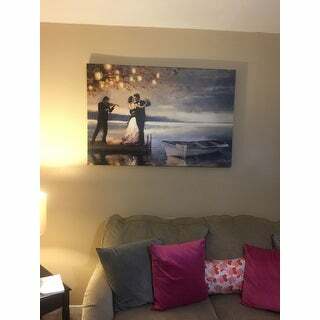 "I like this canvas, but i'm looking for 36 wide x 24 Height , i see this says 24 x 36 is this 24 wide x 36 height"
its 36 inch wide and height is 24 inches....have it over a Queen bed and looks very good..
Beautiful colors and romantic - looking forward to hanging this in my bedroom. Because it’s My stile and is canvas, Ready to Hang it. "Can this canvas be ordered with the female having blonde hair? If so I will order"